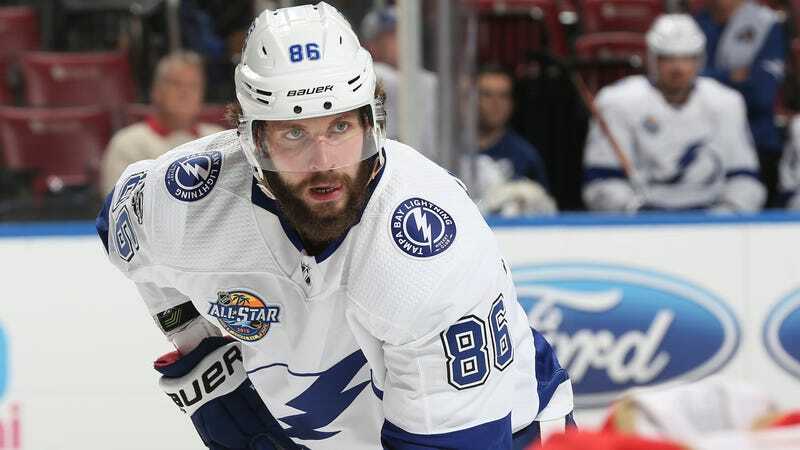 With a game-tying warp-speed slapper that went off the post and in, Tampa Bay’s Nikita Kucherov continued his incredible year-opening streak. Through his first seven games this season, Kucherov has scored in every one. He’s the sixth player in the modern era to do this, and in the last 30 years, only Mario Lemieux, who scored in his first 12 games back in the 92-93 season, has equaled that feat. Kucherov’s goal tonight against New Jersey comes just about 24 hours after a two-goal game in Detroit, which was highlighted by a stellar wrist shot that was in the back of the net before Red Wings goalie Jimmy Howard could even get his glove up. Overall, Kucherov’s got eight total for the year, which puts the 24-year-old well on his way to topping the career-high of 40 he set last season. As a whole, if the Lightning’s current lead holds against the Devils, they’re about to improve to 6-1 on the year. (UPDATE: They lost in a shootout.) Tampa Bay, with its still-young core, is looking to bounce back after an underachieving 2016-17, in which they missed the postseason. That disappointment was preceded by a Conference Finals Game 7 defeat in 2016 and a Stanley Cup Final loss in 2015.